The story I heard is that shrouds on big ships (clippers) terminated on a chain that’s terminated on the chain plate. I don’t buy that as prior vessels still had to terminate shrouds on something. Anywho... the chainplate ties the hull to the shrouds providing improved transference of the sail energy. That’s what I read anyway. Jaysen, your first explanation about chains is correct. The chains were at the lower terminus of the shrouds. Earlier vessels used just ropes alone. The transfer of energy couldn't occur if the mast came down, which it would do if not for the shrouds. Chain plates are used for shrouds and stays. Can be used to support cleats and hardware on deck, they are used under the deck, to bring the load to a stronger support. I finished painting the settee berths. It took more than a week (because of bad weather) to get three nice coats rolled on. No fairing material was used on the settees. I simply sanded the tape edges (several days worth of sanding) to remove any sharp spots and smoothed the edges close to flush. It is a workboat finish but a clean one. Today I was able to get the seat tops glued down- FINALLY! Sort of feels like a moment because they were the last few BIG pieces needed to make her look like a completed boat. There are only a few pieces left to ad now (cabin hatch & trim/ mast partners/ 1x2s along the outside edge of the seat tops (lip to keep things from rolling / sliding overboard) / swing keel/ keel shoe/ skeg/ rudder. Modifying the seat angles from the original plans has been a bit nerve racking but in the end I'm really glad I did it . Her lines still look really good to me. Here are a few pics from different angles. I had to get that crazy flamingo in at least one of the pics. One of the nice thing about building outdoors is not being limited as to what abgles/ distances pics can be taken. Damn they look great!! I do like white in compartments. Still wish you would put a door or hatch between the cabin and deck lockers. I don't have any stories about deck hatches coming off and flooding the cabin durning a sunny, calm and beautiful day. You can get it in latitudes that are hospitable to human life. Bogie your BOAT is looking really good from all angles, even with the green snow still on the ground. Thanks Fellas. Can't wait to get at it again but it's dark out there now, so...guess I'll wait till tomorrow morning. 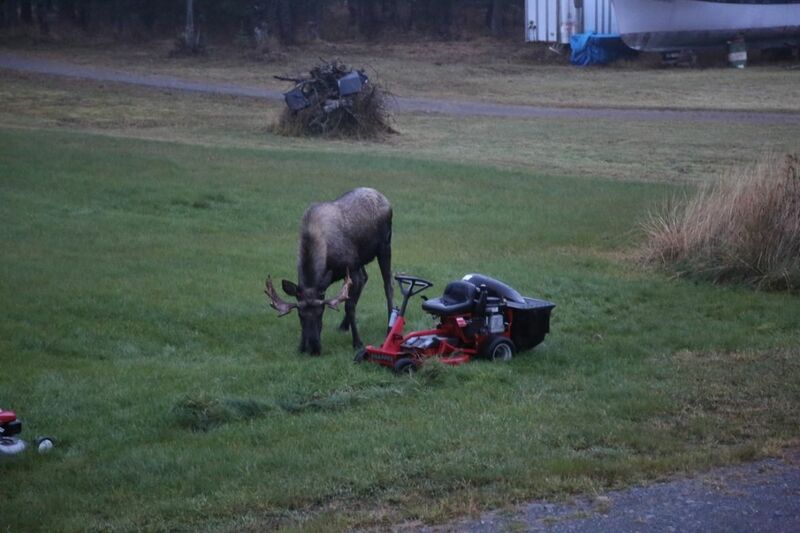 My two mowers. The big one makes the wife’s dog bark...........a lot.